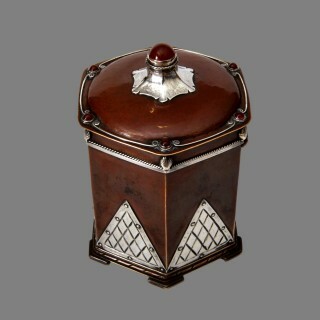 An outstanding, large, arts and crafts , brass, copper and carnelian tea caddy. 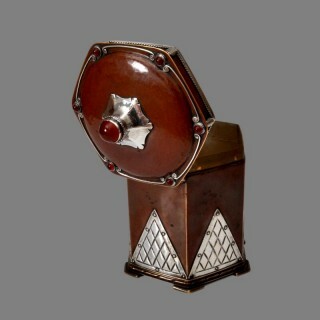 The copper body with applied silver triangular panels. The lid with silver wire work set with deep red carnelian stones. It stands on four brass flat, geometric feet. 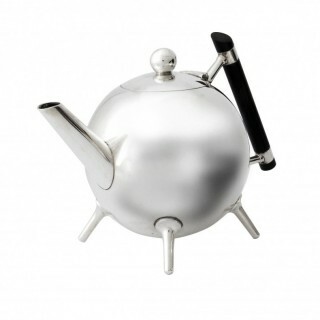 It is zinc lined, a traditional method of keeping the tea fresh. It is in excellent original condition, having been with the same Leicester family since it was made. It was acquired at a small Leicestershire auction. The caddy is unmarked and is in the style of the Artificers Guild. It is, however, by family repute, made by staff and/or students of the Leicester School of Art and Technology in around 1910. This is sometimes known as Newarke Art School (the area in which it was located in Leicester) and later in the 1920’s became the Leicester School of Arts and Crafts. In turn this became part of Leicester Polytechnic, now De Montfort University, which still holds the Art College’s archives. The Leicester School of Art was a hot spot for the of arts and crafts movement at this time. The School boasted Ernest Gimson as a student in the 1890’s (his earliest architectural commissions are in Leicester). The School was headed in 1900 by Benjamin Fletcher (up until 1920 when he moved to head the Birmingham School of Art) who, with Harry Peach, founded Dryad (Furniture) in 1906 and then Dryad Metalwork in 1911. Dryad was one of the more successful and enduring 20th century arts and crafts ventures famed for its cane work furniture and metalwork. Most significantly, Sidney Reeve of the Guild of Handicraft was appointed head of metalwork in around 1907 and he built up a thriving silversmith’s course. Included in “other images” are photos from Leicester School of Art prospectus (1911) showing similar metalwork and from 1920, the workshop. Sidney Reeve is standing at the back of the photo. 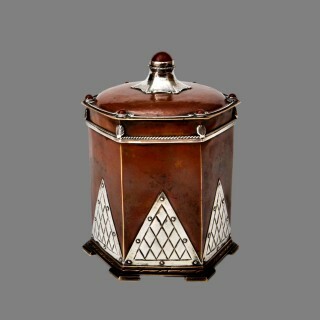 Copper, tea caddies with the Dryad mark are known with the same distinctive thick, lightly twisted wire work seen on this piece.